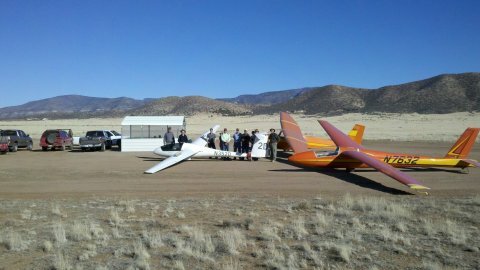 We are a group of sailplane enthusiasts centered mostly around local soaring and instruction in northern Arizona. Costs are kept relatively low by winch launching and operating with the help of a group of very dedicated volunteers. We are located in Coyote Springs north-eastern of Prescott Valley, Arizona. Our club currently owns four sailplanes and we operate off a mile-long dirt runway. Ever watched a hawk fly higher and higher without ever flapping his wings? That is what soaring is all about. Gliding higher, farther, faster, on the silent wind with a spectacular panoramic view of the earth. An absolute pleasure. Sharing the sky with another glider or a hawk is an experience you will never forget. Leave the engine at home and fly like the birds.